I'm quite excited these days about a few equipment upgrades that we've made and thought I would share a behind the scenes peak of it being put to use. 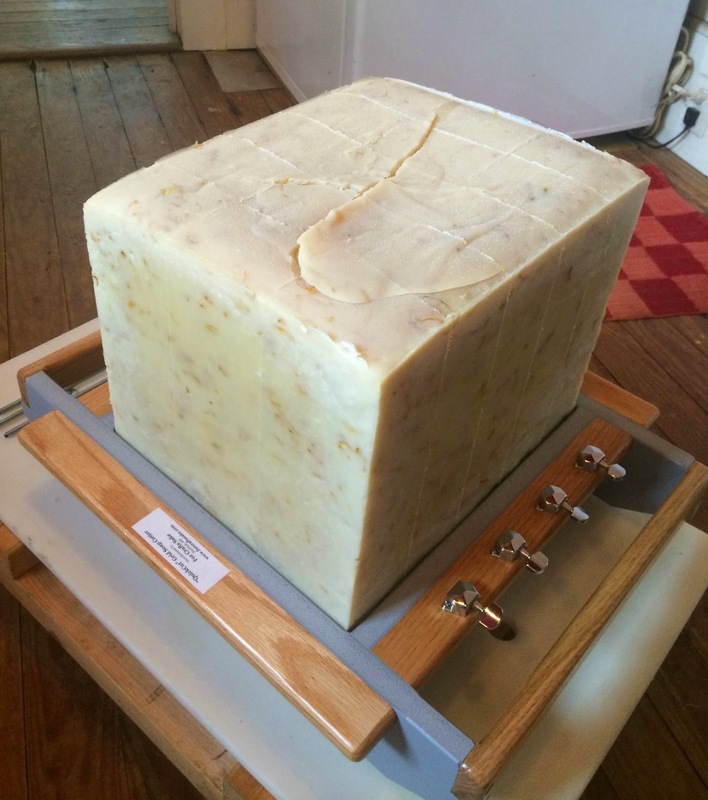 This is a block mold that holds 50 lbs of soap. I typically make 50 lb batches a few times a week, but they have been poured into eight individual loaf molds. Remember these? I had these custom made of indestructible HDPE and I love them. They have been used and abused and still look brand spankin' new. These eight molds combine to make 50 lbs of soap, but sometimes pouring that much by hand into eight cavities can be tricky, especially with some of my recipes that set up really fast. The plus side of these molds is that they allow me to do intricate swirls and designs if I like, so I will continue to use them for that purpose. Big Bertha, as I have lovingly named her, is also made of HDPE plastic. As a block mold, this will allow me to pour all 50 lbs of soap into one cavity. Some of my faster-setting up recipes will benefit from this. While I can still do some swirl designs in this mold, most of what will be made in it will be the solid colored soaps such as Oatmeal, Meadow, Lavender, Plain Jane, etc. So let's see Big Bertha in action, shall we? First, the mold has to be lined. With the eight loaf molds I use freezer paper. With this mold, I use freezer paper on the bottom (which is folded to extend up the sides a few inches), and then custom cut sheets of Mylar secured to the sides. 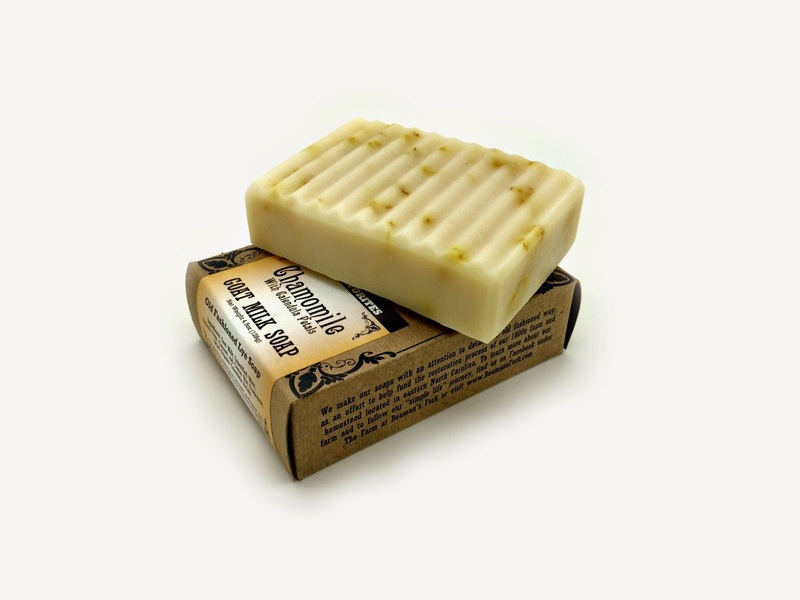 The liner allows the soap, once hardened, to slip out of the mold without sticking to the sides and bottom. Then it is time to make soap. Ingredients gathered, warmed and cooled to the perfect temperature, combined carefully, and then mixed to the appropriate consistency. 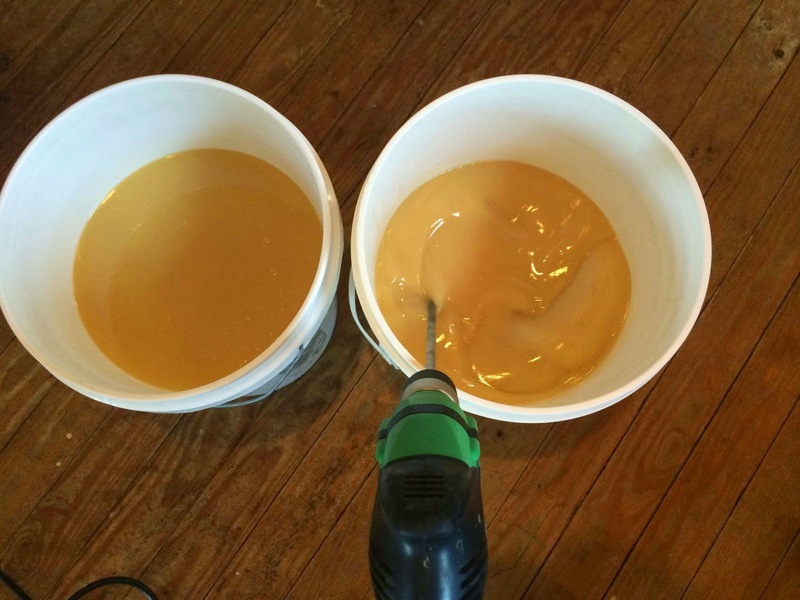 Since I am making 50 lbs, I prefer to work in large buckets, splitting the batch between the two and mixing them simultaneously. It's easier for me to lift and pour that way. The resulting "soap batter" is then carefully poured into the big mold. This is where the magic happens... over the next 24 hours, this mixture will go through a natural chemical reaction called saponification (don't you love that word? ), it will naturally heat up to about 130 degrees, cool back down, and then start to solidify. 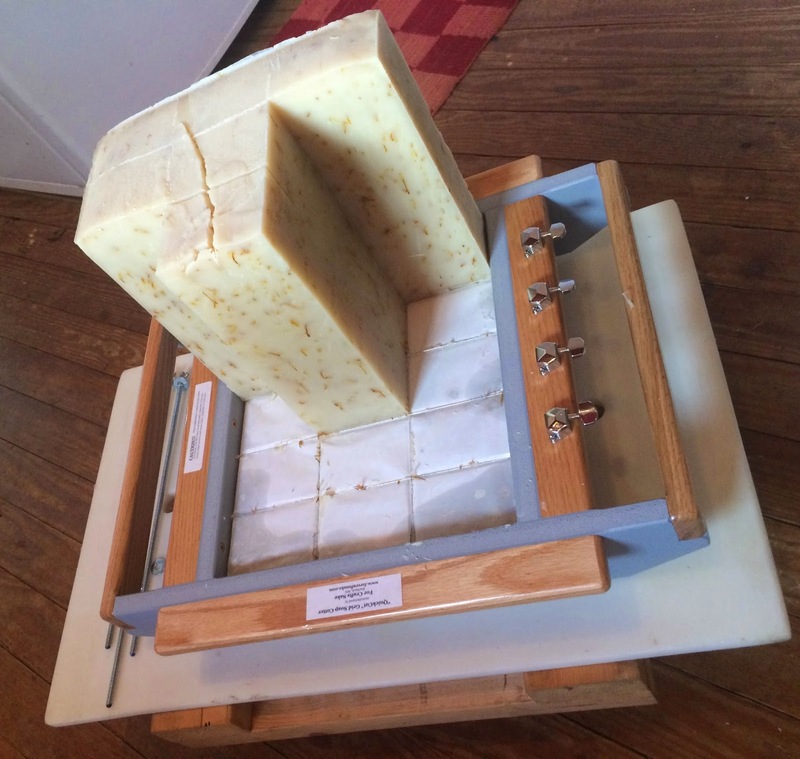 Once it is back to room temperature and solid, the sides are removed to expose the block of soap. The mylar liners are carefully peeled away from the sides. The block then has to be cut. This grid cutter uses a series of wires to slice the block into 15 loaves. It is custom made to exactly fit this block of soap. It is set on top, centered, and carefully pushed down to the bottom until it is cut all the way through. This shows the grid cutter pushed all the way down. The loaves are then carefully removed. I allow the loaves to air dry and continue to harden for about 48 more hours (more or less, depending on the recipe and weather). The loaves are then transferred to another wire cutter, that cuts them into perfectly sized uniform bars of soap. 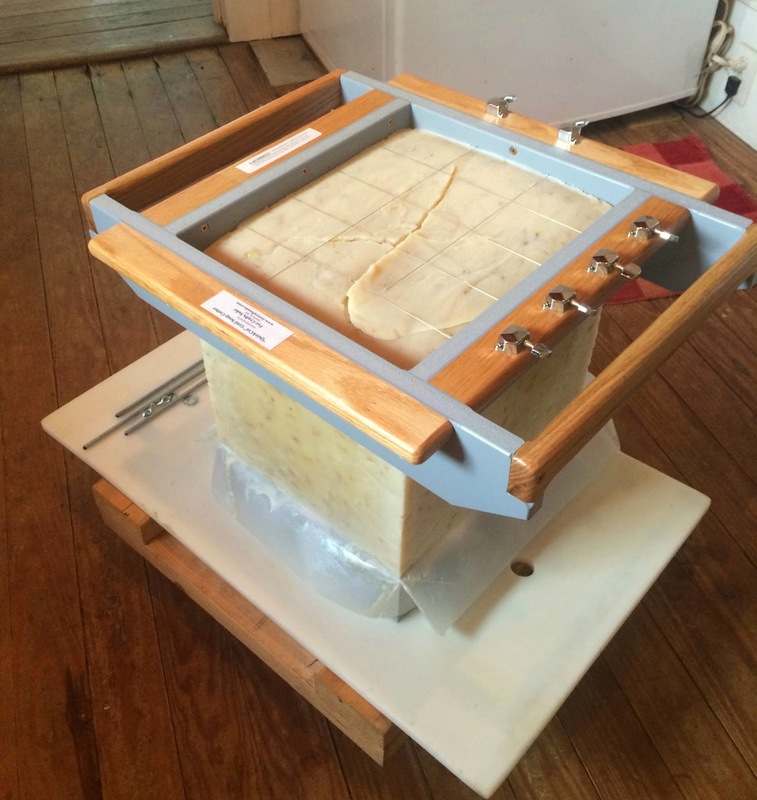 One batch yields 140-150 bars of soap, depending on the recipe. The bars then go to the curing racks, where they cure for eight weeks. After that, they are trimmed up, beveled by hand, boxed and labeled. In a regular week, I typically make three of these batches (150 lbs), or up to five batches. The addition of this block mold upgrade will allow me to nearly double that... but one thing doesn't change at all: it is all still made from scratch, in our farm kitchen, by hand. Just the way we like it. I love those loaf molds.